Almost half of all Internet users use mobile devices. The presence of the mobile version allows to capture these users. Why should adapt the site for mobile devices? It is safe to say that the era of mobile Internet. According to Google, this year the number of mobile search queries has exceeded the number of desktop. Major international companies state the fact that mobile users make up a good half of the total number of users. Today, successful business development just need to meet the demands of time and have a quality site, ready to take smart users. It is easier to view some information or request on your mobile device, rather than look for a computer with internet connection. Anyway mobile-friendly design won't hurt your site, but it will be a benefit! Google will raise your site in search among competitors that did not ensure mobile adaptation. The popularity of mobile devices increases with this mobile traffic is growing in worldwide. Analyzing the sites of our clients, we watch gradual growth of the traffic and now it is about 1/5 of all traffic on the site. 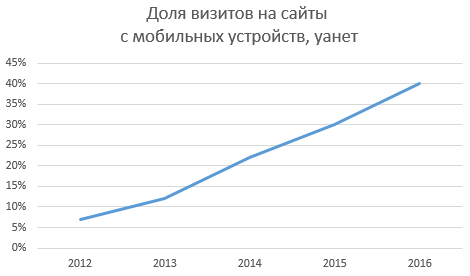 Well, according to the service LiveInternet, the number of people who use mobile devices for web in Russia and Ukraine exceeded the mark of 56 million in February this year. At the beginning of October 2014, Google is improving it`s search algorithms. Promote sites became harder and webmasters put before the fact to prepare changes in time! So in January this year, Google started to send information to webmasters that their sites do not support mobile devices. But in early February, after another great algorithm update, Google said that it has included in the search results adaptability factor to mobile site in beta. Non-adaptive sites will lose their position because they will be passing by sites that support mobile platforms. This is a large loss of traffic. To avoid this give your site to the specialists of W-Start.